Honestly, I’ve not grown this attached to a bike in years. Yes, I have been lucky enough to spend time with a wide range of long term test bikes and I’ve owned a few cantankerous machines of my own but none have got to me to such an extent. The reason? It’s a bike with style and substance. One that’s all about fun without taking yourself too seriously but also one that’s sturdy enough to stand up to five thousand miles of daily commuting. 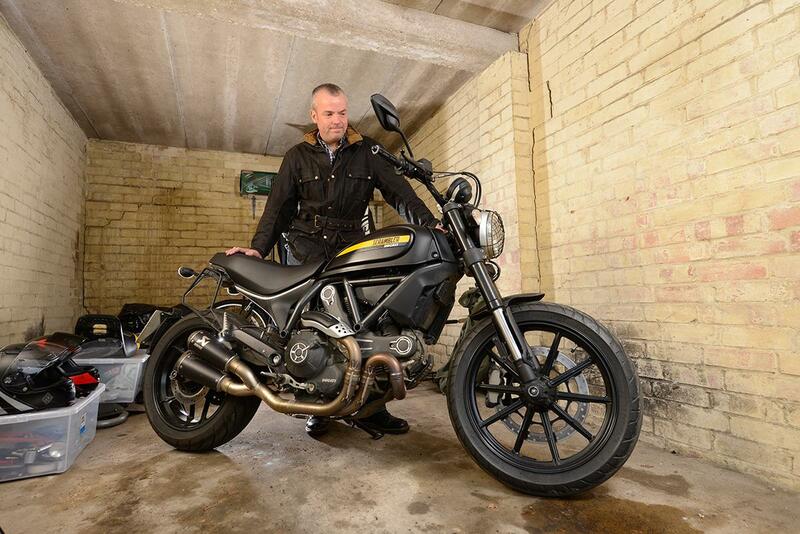 It’s all come as something of a surprise, because normally hype and marketing sends me sprinting in the opposite direction so I don’t think I’ve gone native on the whole Scrambler thing without reason. There’ve been plenty of highlights over the last six months and I’ve learned a fair bit about living with the Full Throttle. The first is that it’s great on trail-style rubber, but better on proper road tyres. The OE Pirelli MT60s offered plenty of grip without too much movement from the tread blocks and looked great, contributing to the FT’s VanVan-on-steroids appeal. Trouble was that by 3500 miles they were totally shot. Next up were Avon TrailRider tyres (costing about £215 mail order). I loved the massively deep tread and they felt fine, although I was concerned when they started losing tiny scallops of rubber. Avon say this was caused by the mould closing and would have stopped happening after a few more miles. Even so, I was keen to try some road rubber and went for a set of Pirelli Angel GTs (about £240) which proved excellent in both wet and dry. The loan period came to an end about 1000 miles later, but they were wearing fine. “What’s the headlight like?” a colleague asked during some office joshing. “I bet it’s awful.” Well, he had a point. I’d imagine the bulk of Scramblers are used for afternoon fun, but pressing the FT into service for after-the-clocks-changed commutes revealed that the illumination isn’t great. Having said that, the headlight guard I’d fitted from the Urban Enduro Scrambler did mean I’d essentially stuck a lampshade on the front. It was a nuisance if I wanted to give the glass a wipe over, too. Still, it looked cute. The OE Termignoni cans sound and look superb but an aftermarket road-legal Akrapovic can was better still. It’s black-coated titanium and has removable baffles should you want to make more noise (I recorded 105dB with baffles in). In terms of both cosmetics and loudness they gave the bike more presence, plus they cut the amount of cracking and popping on the overrun. Not cheap though at £899 (www.performanceparts-ltd.com). This is my first Italian bike in years, and I can report that nothing has gone wrong. No electrical gremlins, nothing dropping off, only a frugal amount of oil consumed. As it should be on a new bike, of course, but welcome. One of the Scrambler highlights was joining the London Distinguished Gentlemen’s Ride. The event was immense fun but the important thing I learned was that the 803cc V-twin is really good in London. The ride was more congested than a blocked artery but the Scrambler proved tractable from low revs and easily threadable through gaps. I did get quite hot though. Well, the bike has gone back to Ducati and I miss it like mad. So much so that I am sorting the finances to get one of my own to keep and enjoy. It will be a Full Throttle, because I reckon it’s the best-looking of the four Scrambler options and has the best riding position with its flatter and more sporty bars. I can’t wait for it to arrive.